Size: 24 x 28 inches. Details: Inscribed ‘Geo. Stubbs 1781’ lower right. at auction in 2011 (see attached article). Basil Taylor, Stubbs, 1971, p211, pl88; Catalogue Raisonné by Judy Egerton 2007, p446 & p447, No 229; George Stubbs published by Tate Gallery publications. Illustrated on page 164. Robert Nesham (his administrators); Christies, 23 July 1928, Lot 153 (1,000 Guineas to Ellis and Smith); Ackermann 1929; Mrs Robert Emmer, Paris; Mrs St Clair Balfour, Hamilton, Ontario; John Alistair Campbell, Alberta, Canada, from whom purchased by Mr. Paul Mellon, KBE, 1964 and presented to the Yale Centre, for British Art, 1977. New Haven, Connecticut, Yale University Art Gallery, Painting in England 1700 – 1850 from the collection of Mr & Mrs Paul Mellon, 15 April – 20 June 1965, no. 176 Tate Gallery, London, George Stubbs 1724 – 1806, 13 February – 7 April 1985, no.122. Biography: George Stubbs was born in 1724 and is perhaps the most important sporting artist of all time. Stubbs made his name through his remarkable capacity to portray the anatomy, muscle structure and movement of the horse. He acquired this talent after extensive travels to study the work of Renaissance Masters in Italy and his own learned researches in what he called his ‘equine pathological laboratory’, where dead horses were suspended from the ceiling for dissection. The result of his labours was perhaps the greatest book in racing literature, The Anatomy of the Horse, which was published in 1766 and which changed the world of equestrian art for ever with its emphasis on precise anatomical detail. George Stubbs is regarded as one of the best horse painters of all time and fine examples rarely appear on the open market. Our example has been in a private collection for many years and with exceptional provenance which can be traced back to 1928. 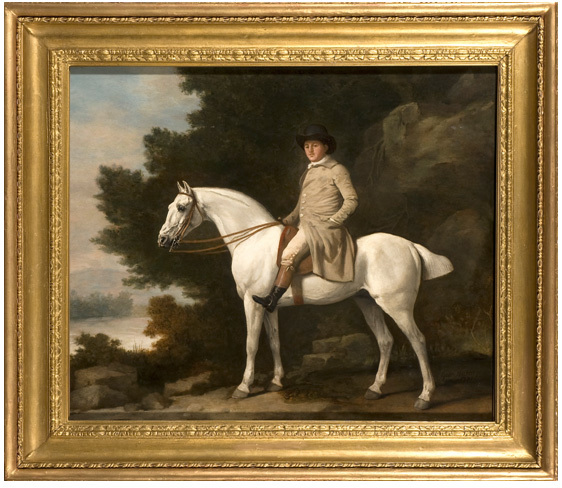 During that time one of George Stubbs’ most famous collectors was Paul Mellon KBE, who was a thoroughbred racehorse owner/breeder and co-heir to Mellon Bank. In 1957, his family were in the top eight richest families in America and in 1964, Paul Mellon acquired the ‘Portrait of a Gentleman upon a Grey Hunter’. Paul Mellon was responsible for setting up the Yale Center for British Art, to which he donated a large proportion of his collection. Mellon was highly supportive of causes that advanced the preservation of horses, including the Grayson-Jockey Club Research Foundation. That organization allocates grants towards specific research projects for the safety, welfare, longevity and improvement of life for race horses. He donated the $1 million bonus that Sea Hero won in the Chrysler Triple Crown Challenge to the United States Jockey Club’s Grayson-Jockey Club Research Foundation. Furthermore he requested that double that amount be raised in response to his donation. That goal was met during the 1995–1996 fiscal year. Upon his death he left yet another $2.5 million to the Foundation’s endowment.